First of all, it’s another step forward in terms of its graphics. When the PC version is maxed out, the players’ faces in particular hold up pretty well. Sure, they can’t compete with today’s 3D scans, but the quality of the face textures and the more realistic head models easily made NBA Live 2000 the best looking game in the series at that point in time. It was still fairly early on in the 3D era, so jerseys do have a bit of a “painted on” appearance, but they still looked better than they did in NBA Live 99, as do the courts and stadiums. 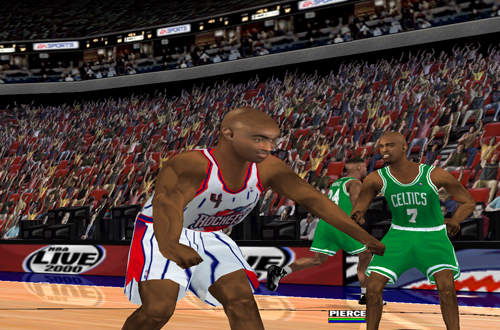 Graphically speaking, NBA Live 2000 is obviously below today’s standards, but it doesn’t look bad, either. The NBA on TNT branding is gone, though the overlays and general presentation are still very reminiscent of a TNT broadcast from the 2000 season. In fact, if you go back and watch the 2000 All-Star Weekend, and then take a look at NBA Live 2000’s in-game presentation, you’ll immediately recognise the influence. The game still boasts several replay angles (including the free cam option), and the menus in the PC version remain user-friendly and easy to navigate, with renderings of random players appearing in the background. The cumbersome substitution method from NBA Live 99 does return though; I’d forgotten that that wasn’t a one time thing in the series. If there’s an area where the visuals don’t hold up as well, it’s some of the animations. Dribbling moves are fine, most of the shots are alright, defensive animations are mostly good, and player celebrations aren’t really a problem. A couple of the layups and dunks do look a little awkward though, especially the latter. On the other hand, there are others that still look quite decent. Players also jump a little high, so screenshots of great moments are often spoiled a little by defenders getting their heads above the rim, or indeed, clipping through it. It’s a game released in 1999 though, so you have to make some allowances for stuff like that. Don Poier returns on commentary, and this time, he’s joined by Reggie Theus. In his review way back in the day, Lutz quipped that Theus must have had a plane to catch when they recorded his dialogue, and he’s pretty spot on with that observation. While having a second voice does enhance the commentary, Theus only chimes in occasionally, and his lines get pretty repetitive. Still, his remarks were a welcome addition to Poier’s upbeat play-by-play, and an improvement over his solo effort in NBA Live 99. Crowd reactions are also great, with excited responses and player-specific chants. Another enhancement to the presentation and atmosphere in NBA Live 2000 was the addition of a referee, visibly signalling calls on the sidelines and tossing players the ball. There was a downside to this however, as the referee also needs to collect dead balls and run into position, which slows down the gameplay. This is especially true during free throws, which still bring the gameplay to a grinding halt. I have to admit that I find it a little frustrating now, but at the time, the novelty of having a visible referee kind of trumped that annoyance. These days however, I like being able to quickly skip to the inbound pass or free throw attempt. 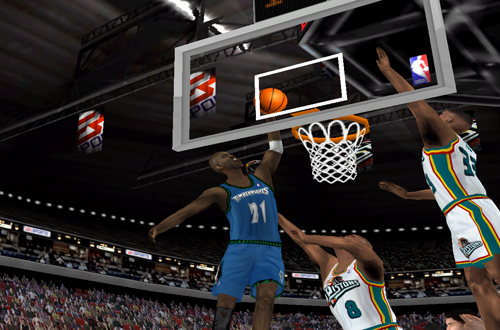 Older basketball gamers generally recall NBA Live 2000 as having some great gameplay, and that’s not just nostalgia talking. I will say that after playing NBA Live 98 and NBA Live 99 again, NBA Live 2000 isn’t quite as big of a leap as I remembered it, but it does still improve upon its predecessors in several ways. There’s further improvement in the smoothness and fluidity of the controls, the pace isn’t too unrealistic on twelve minute quarters (though it still picks up too much in the second half), and overall, there’s a decent amount of realism. If you run plays, player movement isn’t too bad, but it’s sometimes a bit stilted otherwise. The biggest gameplay problems were mainly legacy issues. Dunks and layups still don’t trigger as often as they should, leading to awkward leaners. Steals were toned down a bit, but there were too many blocks, especially by players who shouldn’t be swatting shots with any kind of frequency. Rebounding was better, though there were perhaps still a few too many flat-footed boards. It’s also impossible to start backing down an opponent out of the triple threat position, as you can’t pivot and then put the ball on the floor; you need to move first to start dribbling, and then start backing down. It’s a bit awkward, and really restricts the post game. The AI also gets a little cheap – indeed, very cheap at times – on Superstar difficulty. You’ll find yourself missing far too many shots around the basket, and even poor defenders will stick to you like glue. Post play, which is already kind of basic, is virtually impossible on Superstar. Of course, basketball games still have similar problems today, when you max out the difficulty. Getting the AI to play smarter, rather than simply gaining superhuman skill, is something that EA Sports and Visual Concepts are both still working on. It’s just that these days, we have deeper controls to work with, and games respond a little better to more realistic strategy. Although it’s tough to play physical defense in NBA Live 2000, I still really love the blocks, even if they are a bit too frequent. In addition to big swats, there are also softer deflections, which can be scooped up for an outlet pass. Foul calls are a bit inconsistent, and there aren’t enough free throws, but it’s nice seeing shots go awry when players are hacked on jumpshots. And-one opportunities also feel quite rewarding, especially when they happen on big poster dunks. Jumpshots are still a bit more risky than they should be, but they were starting to become a viable offensive weapon in NBA Live 2000. Ultimately, my take on NBA Live 2000’s gameplay is that it’s still fun to go back and play, and like its immediate predecessors, it’s respectably “sim” for its day. I did find myself encountering a few issues that I’d forgotten about though, and as I said before, while it was an improvement on NBA Live 98 and NBA Live 99, it wasn’t quite as big of a jump as I remembered it being. However, I still think it’s fair to say that NBA Live 2000’s gameplay was enjoyable, with a satisfactory level of realism. Without a doubt, the most exciting enhancement in NBA Live 2000 was the addition of Franchise Mode. After getting a taste of multi-season play in NBA Live 99, we finally had a fully featured team management experience. Players had salaries – albeit in the form of a simplified “points” system, since at the time the NBA wouldn’t allow real salaries in the game – so the salary cap came into play when making trade offers. There was free agency between seasons, and players improved, declined, and even retired as they got older. And of course, generated rookies were available to select in the Rookie Draft each offseason. These days, all of that probably doesn’t seem like much to get excited about, as they’re basic staples of franchise/GM modes that have been done better since. Back in NBA Live 2000 though, it was the first time we were seeing features like that, in a mode that we’d been wanting for at least a few years. I can’t over-emphasise how exciting it was to finally be able to live out our GM fantasies as we played (or simmed) season after season, experiencing the offseason in between. For many of us who played the game all those years ago, it tipped off our obsession with this type of mode. Franchise Mode was the big new feature that basketball games needed, and basketball gamers were eager to see. It represented continued innovation, and a commitment to packing as much into one release as possible, from gameplay enhancements to brand new modes. Franchise Mode in NBA Live 2000 is also pretty much free of any major issues or game-breaking bugs. The only real problems are the lack of certain features that would be added in later games, which is nitpicking given that the mode was brand new. When it comes to game modes, Franchise made a very impressive debut. On the subject of game modes, NBA Live 2000 retained the Practice Mode from NBA Live 99, with the shootaround still taking place on an outdoor street court. EA Sports expanded on the idea by adding a second player to the mix, as a new One-on-One mode also made its debut, with options for winner’s or loser’s outs, and winning score. Gamers could even toggle between playing at night or during the day! The three-point shootout returned, unchanged but nevertheless as fun and functional as before. Online multiplayer was also supported via modem play, and offered both five-on-five and one-on-one action. 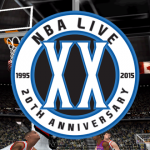 To date, NBA Live 2000 is the last game in the series to offer in-game saves. Users could also save replays, and while they can be shared with other users, there’s no in-game function to export them as video files; that would come next year. The presence of in-game saves was not only a convenience, but once again facilitated the creation of scenarios that others gamers could download and play. 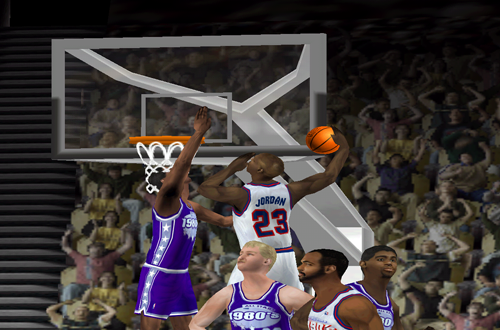 The aforementioned One-on-One mode was also branded with Michael Jordan’s name, as he was one of the default players selected upon entering the mode (Duncan being the other). In fact, defeating MJ in a one-on-one game was the method of unlocking him for use in the Nintendo 64 version of NBA Live 2000, which didn’t feature any other Legends. 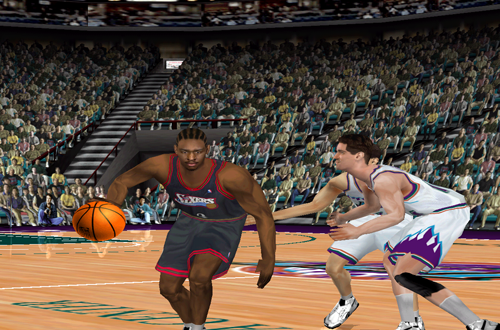 In the PlayStation version of NBA Live 2000, Legends could be unlocked using codes, while all Legends were unlocked out of the box in the PC version. Due to different release and roster cut-off dates however, certain players are missing from some versions of NBA Live 2000 and not others. As I mentioned in a recent edition of Wayback Wednesday, the PC version of NBA Live 2000 also introduced Face in the Game, a means of using a photo to add a proper face to a created player. A distant forerunner to GameFace HD in NBA Live 16, it worked quite well, and was another feature that contributed to the PC release being the definitive version, in most respects. 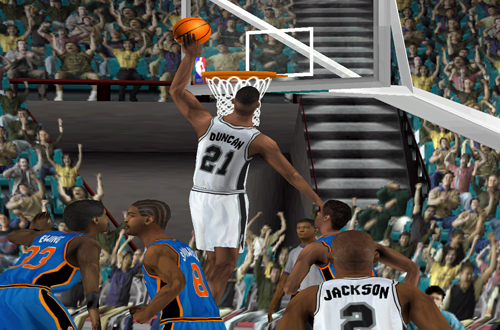 NBA Live 2000 retained the basic staples of roster customisation, though it did have a limit on the ratings points that could be assigned in Create-a-Player, preventing the creation of maxed out players. A fair idea in theory, but when creating historical or special rosters, it was a bit of a nuisance. The patching community at the NLSC had been firmly established by the release of NBA Live 2000, and in the game’s heyday, all kinds of patches were being made. High quality packs of faces for missing players. Detailed current roster updates. Historical roster updates. Superhero faces. Real and fictional updates for courts and jerseys. New gear for the Practice and One-on-One modes, not to mention an assortment of shoe patches. It’s a shame a lot of those releases have gone missing over the years, as the NBA Live patching community was really on fire in those days. That said, we’ve still seen releases for the game as recently as 2015! Despite rediscovering some of the flaws that nostalgia tends to gloss over, and noting certain aspects of the game that haven’t necessarily aged well, I still hold NBA Live 2000 in very high regard. Although some of the legacy issues were definitely an annoyance at the time, they are somewhat exacerbated upon going back and playing the game now, as I’ve grown used to playing far more advanced basketball titles. A few of those problems did certainly bug me back in the day, but they didn’t stop me from having a lot of fun with NBA Live 2000. Honestly, while they do stand out a little more playing the game now, it’s still fun to play. 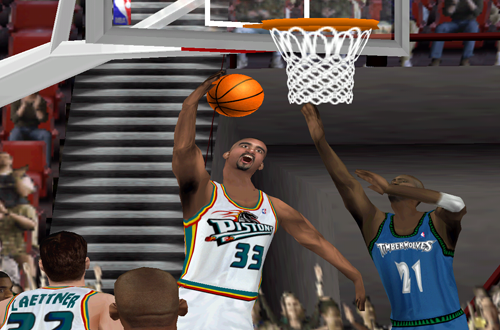 NBA Live 2000 isn’t just considered a classic and a high point in the NBA Live series due to nostalgia; it has that reputation because it boasts the hallmarks of a great basketball video game. It represents the sport to the best of its abilities given the technology of the era, resulting in a deep and well-rounded game with engaging and innovative modes, appealing bonus content, and overall enjoyable gameplay. It may not be perfect, and it’s since been surpassed, but in its day, NBA Live 2000 was the best NBA sim on the market, undoubtedly raising the bar for its successors. Another solid article Andrew, good read. This was the last game I had on ps1 before getting Live 01 (KG) and my ps2 which is where for me I really got into the series. Thanks for checking in, glad you’re enjoying the retrospectives! Yeah, the CPU wasn’t too bad at giving itself free throws, but isn’t that always the way? I actually picked up the PS1 version myself last year, since I found it going cheap on eBay. In most respects, it’s the same as the PC version. I also had the N64 version back then; I have to imagine I got that one for Christmas, as I wouldn’t have had the disposable income to double dip, and I distinctly remember going to buy the PC version. Andrew, thank you very much for bringing back all those special memories I had playing this game as a kid! This is by far the best game I have ever played. I have played games that were better made, or had superior graphics, or demanded more brain power and effort from the gamer, but this is the game that has endured, and takes me back to a time that I don’t want to forget. It is also the game that got me closer to the sport. I was a 10-year old living in Bangalore, India at the time, and my parents promised to buy us (I have two brothers around the same age) a video game for our birthday (one of my brothers is a twin). Up to that point, we hadn’t really played any sports games, but we did try out the NBA Live demo at a relative’s place and loved it, so we thought that’s the one we should get. So glad we did. The LA Lakers were the world’s most famous basketball team at the time, and apart from Michael Jordan, only Kobe Bryant, maybe Shaq too, were household names in India. So it made logical sense to play with the Lakers in season modes. We had never even bothered with Franchise mode (not knowing what it meant back then), so single-season affairs were all that we could experience at that point in time. 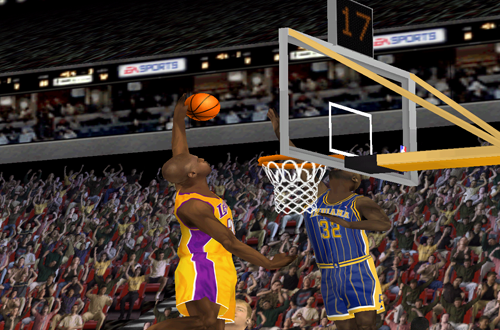 Still, it was so much fun posting up with Shaq and dunking over literally every big man’s face! Glen Rice with his three-pointers, Kobe with massive showtime dunks of his own…they were dominant, both in real life and the game. Testament to the realism of NBA Live 2000. It started to get easy to win with the Lakers. We needed a change. It was my twin who decided to experience the “Franchise mode” feature. He chose the Sacramento Kings, a really exciting team at the time, and they had a big man of their own who could dunk almost as effortlessly as Shaq in Chris Webber. We didn’t really follow the 2002 NBA Playoffs and would never know of the highly controversial Western Conference Finals series between the Kings and the Lakers until much later. But we didn’t need that to warm to the Kings. J-Will (who woulda thought – a Florida Gators alum! ), C-Webb, Divac, Corliss Williamson, Stojakovic…what a team that was! And when the season ended, there was more to come. Draft picks! Free agency! Amazing! We were so excited! This was the stuff of dreams. Years later, by which time we all had jobs and I was just lazing around watching vintage basketball highlights, I decided to pick out the old CD and install the game on a Windows 7 laptop. And it worked flawlessly. The game endures. It’s the one game I can always go back to. I still play it to this day. Thank you, Andrew, for the review, and thanks for maintaining this website and helping out hungry souls like me who can’t live without NBA Live 2000! Cheers! Appreciate the kind words, and thanks for sharing your memories! NBA Live 2000, though it has been surpassed, is definitely a classic.